The Timberwolves are about to embark on their second-longest road swing of the season. 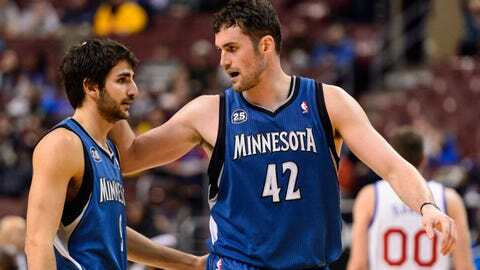 MINNEAPOLIS — Years ago, Kevin Love left behind the nostalgia associated with an in-season return to his home state. And with the Timberwolves’ clash at Portland this Saturday serving as just one of four obstacles between Minnesota and a successful, potentially pivotal road trip, there’s little reason to rekindle it now. "Early on, it meant a lot to me," said Love, who grew up in Lake Oswego, Ore., a southern Portland suburb, "but now, it’s just become another game like anything else. But that’s a very good team. If we’re gonna be where we want to be, we’ve got to beat teams like Portland like we did back in December. "Hopefully, we can kind of gauge and see where we’re at, because they’re one of the better teams in the league." So are the Warriors, whom Minnesota takes on Friday. First comes Tuesday’s clash at Utah, and a Monday, Jan. 27 tilt at Chicago wraps up the second-longest road swing of the Timberwolves’ season. They flew out of the Twin Cities on Monday afternoon and won’t return for a week. Sitting at 19-21 and four games out of a playoff spot, Minnesota can’t afford to sink much deeper. But even staying afloat the next four outings won’t be easy. Three of the Timberwolves’ next four opponents are riding hot streaks, and the Western Conference cellar-occupying Jazz are expected to come out with a vengeance after being manhandled Saturday at the Target Center. As of Monday afternoon, Golden State, Portland and Chicago are a combined 40-17 at home, while Minnesota has won just seven of its 20 road games — the third-fewest in the West. The Timberwolves are 0-11 in games decided by four points or less, 2-12 in games decided by five points or less, and haven’t won more than two games in a row since claiming victory in the first three contests of the season. "A lot of things have had to happen for us to lose those games, but the fact is we haven’t won one," said Love, who’s a near lock to hear his named called Thursday when the NBA All-Star teams are announced. "It’s gonna happen; we just need to string a few of those together, and I feel like if we win a close one, that’ll be hopefully the end of that talk." The next chance to mount a run comes Tuesday night at Utah’s EnergySolutions Arena in a contest that closes out a stretch thought to have presented Minnesota an opportunity to climb into the playoff picture. But with losses to Oklahoma City, Phoenix, San Antonio, Sacramento and Toronto this month, the Timberwolves are 5-8 in their past 13 contests and starting to run low on time to start streaking. They’ll play Utah for the second time in as many games, a potential mental block after holding the Jazz to a franchise-worst 28.8 percent shooting and beating them 98-72 on Saturday. "It just makes it difficult mindset-wise, especially when you win by 25,30 points the first time," shooting guard Kevin Martin said. "You think you’re going to go into their place and do the exact same thing, but they’re gonna come with a better effort. They’re not gonna miss some of the shots they missed the other night." Then comes a back-to-back, Friday-Saturday 3-point shooting gauntlet on the West Coast. Led by Klay Thompson and Stephen Curry — Nos. 2 and 3, respectively, on the NBA’s made 3s list — Western Conference No. 6-slotted Golden State has connected on more triples than every team save for one. That’d be the Trail Blazers, who host Love and company Saturday night. Damian Lillard’s 128 made 3s top the league and are a big reason why Portland is a half-game back of San Antonio for the conference lead. "Some of the teams weâll see on this trip, weâll find out about three-point shooting," said coach Rick Adelman, whose team knocked off Portland 120-109 on Dec. 18. "Because thatâs what they do, and thatâs why theyâre good teams. Because theyâre consistent, night-in and night-out." That description still doesn’t fit the Timberwolves. Now might be a good time to start attaining it. "It all starts tomorrow," Love said.